The Bayeux Tapestry is “certainly one of the most important works of pictorial narrative art” (Noxon, 1968, p. 29). At around 230 feet long, the embroidered “tapestry” depicts the story of Harold Godwinson, William of Normandy, and William’s eventual succession of Edward the Confessor’s throne. 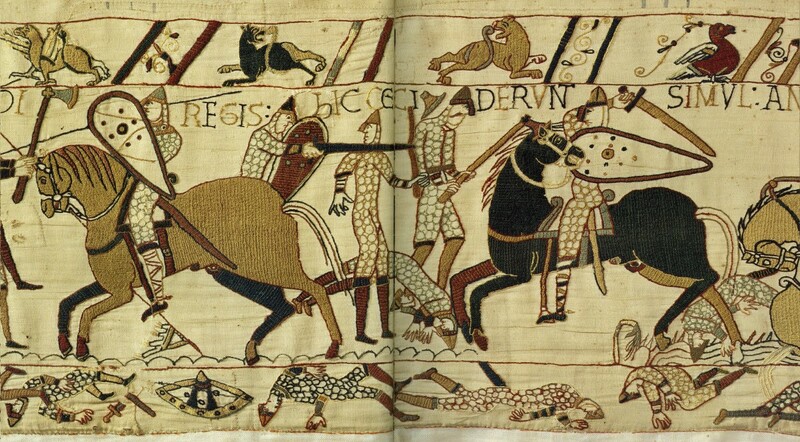 According to the tapestry, Harold, an English noble, broke an oath of fealty he had made to William while in France, and claimed the throne for himself, resulting in William’s invasion of England and the bloody Battle of Hastings in 1066. The Bayeux Tapestry gives the complete series of events, being one of “the fullest pictorial record[s] of a medieval battle in existence” (Bartlett, 2010). Despite its cartoony representation, the expressive images of the tapestry can tell us not only about the happenings associated with Harold and William, but also about warfare during the Medieval period. The tapestry is a “complex dramatized narrative, part truth and part fiction” (Noxon, 1968, p. 29). The Normans won the battle and William became king, making it likely that the tapestry was made as a commemorative piece. Because they did win, there could very well have been some embellishments to the story. It is obvious that the tapestry was a “sponsored, propaganda work, designed for an illiterate mass audience,” that was probably commissioned by William’s half-brother Odo, the Bishop of Bayeux (Noxon, 1968, p. 30). It would have been important for the makers to represent Harold as a “brave warrior” with the “fatal flaw[s]” of “overweening pride and vanity,” rather than as a power-hungry villain, because he still had many supporters in England (Noxon, 1968, p. 30). The scene from the tapestry below depicts the Battle of Hastings in all its brutality (Wilson, 1985, Scene 65). The middle and largest band shows the “brutal clash between the onrushing [Norman] cavalry and the stolid, heavily armored group of [English] foot soldiers” (Noxon, 1968, p. 34-35). The bodies of the dead can be seen in the lower margin, including one near a broken sword (Wilson, 1985, Scene 65). Scene 65 from the Bayeux Tapestry, Wilson. The scene depicts the intense fighting during the Battle of Hastings. As can be seen by looking at the scene, the Bayeux Tapestry is without a doubt the “best pictorial source of information about the arms and armour of the Normans,” as it illustrates much the equipment and weapons used by their army (“Weaponry,” 2006). The tapestry scene displays many of the characteristics that set the Normans apart in battle. A Norman soldier usually wore a “knee-length mail shirt called a hauberk that…was split from hem to fork to facilitate riding” (“Weaponry,” 2006). The use of chain mail armor allowed for greater movement, which would have been very important for cavalry. Additionally, the Norman horseman would wear a conical steel helmet, with a “wide [nasal] to protect the nose” (“Weaponry,” 2006). The most popular shield was kite-shaped, which provided more protection to the soldiers than the common round shield that was often used. The basic weapon for the Norman cavalry and infantry was the spear, but the cavalry also made use of swords. These were crucial because, “unlike the lance or spear that was easily broken and usually discarded during battle,” swords were much more durable and also highly “valuable [possessions]” for the Normans (“Weaponry,” 2006). Another weapon that may have been even more devastating than the spear and sword was the axe. “If the Bayeux Tapestry is to be believed it could inflict more dire wounds than any other weapon on the battlefield,” and if the Normans fought the battle mostly from horseback, it appears that the English actually made more use of these fierce weapons (“Weaponry,” 2006). In this panel, the Latin inscription tells us that “[h]ere at the same time English and French fell in battle” (Wilson, 1985, p. 173). It shows the battle getting more intense, with an axe getting “decapitated,” a horse being struck in the head, and a number of soldiers wielding swords and axes “with great abandon” (Wilson, 1985, p. 192). This all would have been taking place after the English “broke ranks to pursue” the Normans, and were lured “into a more vulnerable position,” where the Norman forces could finish them off (Bartlett, 2010). This panel from the Bayeux Tapestry, with its vivid colors and dramatic fighting, sheds a lot of light on the subject of Norman battle tactics, and will surely continue to be one of history’s greatest pictorial narratives. Bartlett, R. The Bayeux Tapestry. (August 3, 2010). Retrieved March 26, 2014 from http://www.bbc.co.uk/blogs/ahistoryoftheworld/2010/08/the-bayeux-tapestry.shtml bbc.co.uk/blogs. Wilson, D. M. (1985). The Bayeux Tapestry. New York, NY: Thames & Hudson, Inc.